Mt. Zion Baptist Church is well established in the Tulsa community for supporting the education and development of our youth. Our presence in the community for over 100 years gives witness to the importance our mission. We are pleased to offer you the opportunity to join our efforts to make a difference in the lives of young Tulsans by becoming a community sponsor for this Mt. Zion charity event. 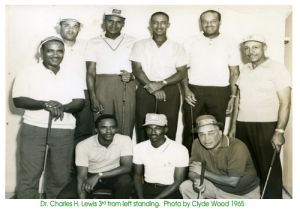 The Fifth Annual Golf Tournament honoring the late Dr. Charles Lewis, Founder of the Oil Capital Golf Club Association, is a charity event sponsored by the Mt. Zion Baptist Church Men of Valor Ministry. Dr. Lewis was a Tulsa dentist who was actively involved in the community an abiding love for golf. This golfing charity event will be Saturday, July 30, 2016, at White Hawk Golf Club in Bixby, Oklahoma. As a sponsor you will be contributing to the development of Tulsa’s youth and ultimately its future. We invite you to join our efforts for this event. You will receive community and statewide recognition in advertisements and public announcements for supporting this worthy cause. We anticipate a successful and well-attended golf outing based on previous tournaments. Various levels of sponsorships are available. For additional information, please email us at drcharleslewisgolfouting@gmail.com or call Ed Thomas @ (918) 284-3313, Kenneth Caddy @ (918) 361-8521 or Victor Latimer at (918) 695-8227. We thank you in advance for your support.